Showers, both lake effect and from a small disturbance, will move through the FLX and CNY on Thursday, but nicer weather will settle in for Friday and Saturday. Thursday’s weather will not be a washout, but it will be a cool day with some occasional light rain showers. The air is cool enough this morning for some limited lake effect rain showers off of the southeast end of Lake Ontario. Lake effect, whether snow or rain, thrives off of vast temperature differences between the warm waters of the Great Lakes (or Finger Lakes if the winds are perfectly aligned) and the cold air above the water. Late August is usually the start of the lake effect season when a cool pattern like this sets up. 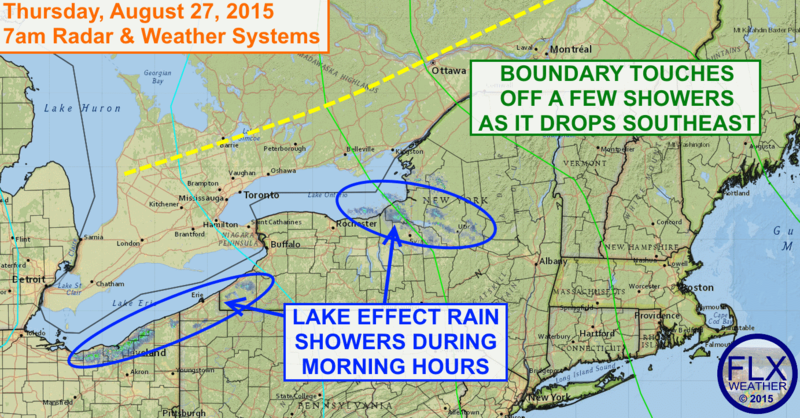 A few waterspouts have even been observed in the lake effect over the last day or so. Areas downwind of Lake Ontario and Erie are not the only ones who will see a few light showers today. A small disturbance is dropping southeast out of Canada. As this passes over Lake Ontario, it should pick up the lake effect and push it further south. This will be in addition to the scattered showers it triggers on its own. The best chance for showers across the Finger Lakes will be in the late morning and early afternoon, but a few showers may linger longer into the afternoon as well. Temperatures today will be a bit chilly, with highs only managing the upper 60s. Nicer weather is on the way, though. High pressure will build in tonight and linger through most of Sunday. Sunny skies will return starting Friday, with temperatures returning to the mid 70s. Saturday and Sunday will be even warmer, with highs reaching into the low 80s. A few showers or storms may move in late Sunday. Meteorologist Drew Montreuil has been forecasting the weather in the Finger Lakes region since 2006 and has degrees in meteorology from SUNY Oswego (B.S. with Honors) and Cornell (M.S.). Drew and his wife have three young boys and also run a goat milk soap business, Ye Olde Goat Cart. When not working or playing with the boys, he is probably out for a run through the countryside. Get the latest blog posts delivered to your email inbox, free!